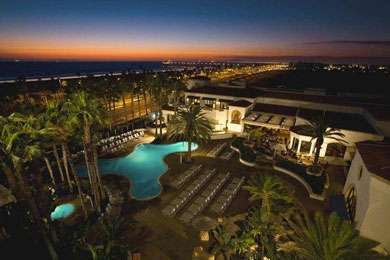 Overlooking Huntington Beach’s 8.5 miles of wide, soft sand and oceanfront, is the Waterfront Beach Resort, a Hilton Hotel. The 12-story resort features 290 oceanview guestrooms and suites, an elevated pool deck with ocean views, award-winning dining, and tons for families to enjoy while visiting Orange County. 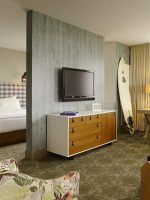 In 2014, the resort completed a full renovation of all rooms, and accommodations now feature a Southern California theme. 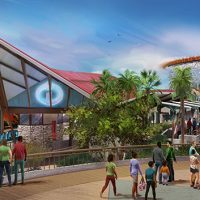 With its ideal beachfront location and short distance to Disneyland Resort, the Waterfront Beach Resort and its array of amenities make it a great destination resort for families. Standard rooms at the Waterfront Beach Resort are 350 square feet in size with either one king bed and one double sofa bed, or two double beds. 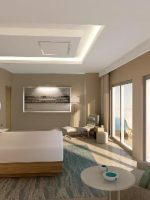 The first four floors of the hotel are resort view rooms, while the upper floors feature ocean views with sunrise or sunset options. The rooms are outfitted with 32-inch flat-screen TVs, Wi-Fi (for a fee), coffeemakers, and feature small balconies. Nine one-bedroom suites offer 650 square feet with separate living and dining areas and a bedroom. Suites provide wraparound porches with oceanfront views. Two 40-inch, flat-screen TVs are featured in the bedroom and living room. A king bed is housed in the bedroom, with a sofa bed in the living room, making these popular options for families. Deluxe options, of which there are three, are 1,050 square feet and feature a second bathroom. Wi-Fi (for a fee) and coffeemakers are also included in the amenities. Eleven Executive Suites are studio suites with open living and sleeping areas. A king bed and a sofa bed sleep up to four, although only one TV is offered in the living area. The bed faces the ocean for the best views. These oceanfront suites feature 40-inch, flat-screen TVs, Wi-Fi (for a fee), and coffeemakers, and are 550 square feet in size. 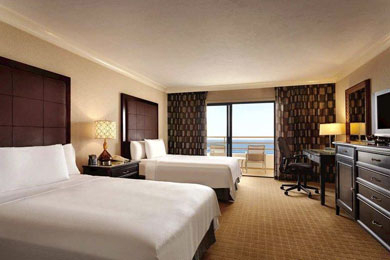 The resort offers three premium suites: the Twin Dolphin Suite, the Governor's Suite and the Presidential Suite. 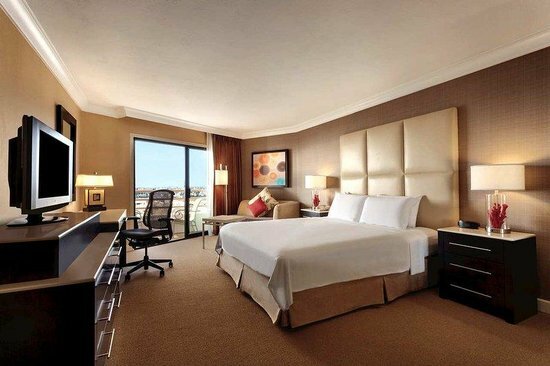 Located on the 12th floor, the Twin Dolphin Suite is 1,050 square feet and the remaining suites are 1,000 square feet. The suites come with separate bedrooms and living areas with one king bed and one sofa bed, 40-inch TVs, wraparound balconies, coffeemakers, Wi-Fi (for a fee) and ocean views. Stayed at this for a conference. We were in the new Dolphin tower. The room was beautiful and so was the view. Hotel is across the street from the beach so it’s a few minute walk to get there. Lots of nice restaurants nearby. The hotel restaurant choice was limited as their high end dining option is currently being renovated. However everything we had at Boardwalk restaurant was good. Just a limited menu. The pool area looked good with a water slid and ample seating. From a conference standpoint this is a good place for a small event. Ours was a little strained and needed bigger space. The conference food was very good. I would definitely consider staying here again for business or leisure when in the area. We love this hotel - just be aware of construction. We have stayed here before, and the hotel is great. The hotel staff is spectacular. Great food. Excellent rooms with great views. We will most definitely stay here again. However, if you are considering it, just be aware of the construction going on near the Huntington tower. Our only "complaint" about the entire 2 days we stayed was our short time in the spa. I paid for just a day pass to use the facilities (steam room, sauna, hot tub, relaxation room.) It was probably my shortest stay ever in a hotel spa. All I could hear in the sauna, and the steam room was non stop jackhammers. It was the exact opposite of relaxing. I don't think the spa is extremely close to the construction, but the sound was definitely coming in somehow. My wife went in a little after for a facial and said it was bad during her facial too. So it was definitely a wasted effort to relax at the spa. Next time, if there is still construction, we will definitely check on the noise situation first. 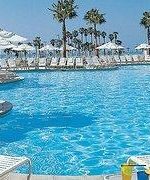 The hotel's large pool is located on the first floor, one floor up from the lobby so that, although the hotel rests on the Pacific Coast Highway, guests in the pool and lounge chairs look out at the ocean and do not see the street. The pool is heated to 78 degrees in the winter and lowered in the summer, depending on the temperatures. Cabanas are available by reservation. It is open daily from 7 a.m. to 10 p.m.
With 8.5 miles of beach across the street, a day in the sand is a big draw for families. Families can elect to have a beach wagon complete with towels and chairs packed up by concierge or hire a beach butler who will set up chairs and an umbrella for families. (Both cost extra.) The beach wagons also come with hot dogs and buns, cooking utensils, chips and soft drinks, as well as ingredients for S'mores for the beach's numerous free fire pits. For a little more of a splurge, go for the full butler service that will deliver drinks and lunch. Guests can select from four in-room experiences. The Hollywood Classic, at $20, features a tub of buttered popcorn, peanut and plain M&Ms, a box of licorice, and soft drinks, along with the choice of one in-room movie. You can also try the Sweets in the Sheets in-room movie experience with a dessert platter and carafe of hot chocolate. Dinner and a Movie and Margaritas and a Movie are additional options. The resort has tennis courts and bicycle rentals onsite for families looking for outdoor fun and exercise. 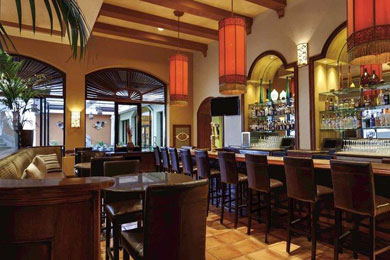 The resort's feature bar/restaurant is the award-winning Shades. Indoor and patio dining are available for a unique menu with farmer's market ingredients. Don't miss the bourbon-infused peanut butter and pepper jelly sandwiches on Amish bread! Sunday mornings feature a Champagne brunch. A children's menu is available. The restaurant is open 6:30 a.m. to 3 p.m. for breakfast, lunch and snacks, and then reopens for dinner from 5 to 10 p.m. Casual meals are served 3 to 11 p.m., Sunday through Thursday, and until 1:30 a.m. on weekends at the Shades PM Lounge. For grab-and-go breakfast pastries and lunch sandwiches, as well as snack foods and drinks, visit this first-floor market. The market features a full bar and Starbucks coffee and offers an outdoor fire pit with ocean views. It is open daily from 6 a.m. to 10 p.m.
In-room dining is available daily from 6 a.m. to 11 p.m. on weeknights, and until 1 a.m. on weekends. A children's menu is available for breakfast, lunch and dinner items. Gluten-free menus are available, and families with special dietary restrictions can let the front desk know at check-in and then receive menus catered to those needs during the duration of their stay. One of the best perks offered by the resort in peak season, Memorial Day through Labor Day, is a free shuttle to Disneyland Resort. 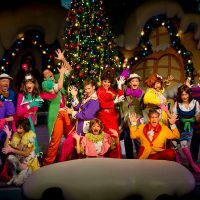 Two morning departures take families, at no charge, to Anaheim's theme parks and provide two evening pickup times so families can enjoy Disney without any hassles or parking costs. During the summer, family-friendly activities are also offered at no additional charge, and include balloon art, face painting, cookie decorating, treasure hunts, fire dancers and more. 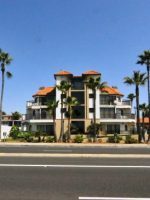 The hotel is pet friendly and welcomes both dogs and cats with beds, feeding dishes, treats and guides to pet-friendly areas, including Dog Beach, Huntington Beach's dog-friendly beach. Pets are $50 each and a five-night maximum stay is allowed. Pets cannot weigh more than 75 pounds. Wi-Fi is not free; a daily fee of $12.95 applies. 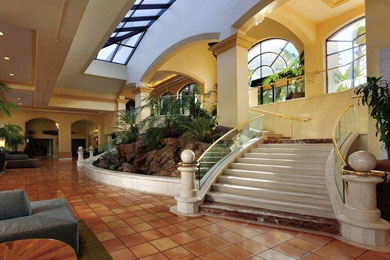 Parking is available by valet only, and is $32 per night. Check-in is at 4 p.m. and check-out is at noon. 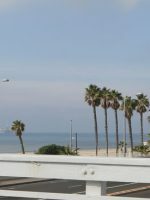 Huntington Beach is a year-round destination, but the resort offers more for families during the summer months, between Memorial Day and Labor Day. If looking for things to do at the hotel, visit during this time. However, if seeking a quieter time in which to stay while exploring the Orange County area, off-peak visits will be less crowded. 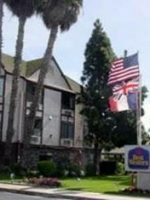 Just 40 minutes from Los Angeles International Airport, the Waterfront can arrange transportation to the resort from LAX, Long Beach Airport and John Wayne Airport, for a fee. Parking at the resort is valet only and is $32 per night, but the resort is situated right on the beach and provides free transportation to Disney in the summer -- the resort is 20 minutes from Disney. You do not need to rent a car to enjoy a stay at this resort. The resort's Pacific Water Spa provides full spa and salon facilities for a relaxing afternoon of massages, facials, body treatments and more.